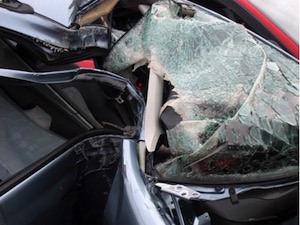 The Miami car accident lawyers and personal injury attorneys at the Wolfson Law Firm represent victims of broadside or side impact collisions in Miami. These collisions are sometimes referred to as T-Bone car accidents. Some of the most severe injuries our lawyers have seen are caused by these side impact car accidents. Unfortunately, accidental or wrongful death cases in Miami can, and do result, from these broadside car crashes. If you suffered serious injuries as a result of broadside, T-bone or side impact car crash in Miami, our Miami personal injury lawyers and wrongful death attorneys can help you and your family. All you have to do is call us at (305) 285-1115 for your free and confidential consultation. Let our personal injury legal team in Miami assist you through these difficult times. Steering or Brake Malfunction or Failure – This is one of the least frequent causes of T-bone car accidents in Miami but it does happen. If a driver has steering or brake failure, they may end up going into an intersection they don’t intend to causing a tragic accident with oncoming vehicles. Interestingly, if the brake or steering failure was not foreseeable, the driver may not be liable for the accident. It is not negligence if a sudden and unexpected mechanical failure occurs. On the other hand, if the mechanical failure was foreseeable, the driver may be responsible for the damages caused. A garage or mechanic might also be responsible for failing to properly repair the vehicle. Your Miami car accident lawyer will need to perform an in-depth investigation to determine who, if anyone, is responsible for the T-Bone accident if someone claims mechanical failure. Weather related T-bone car crashes – In Miami we don’t have to worry about ice or snow, but we do get a fair amount of rain and on occasion, fog. Many accidents happen after a dry spell and it rains for the first time in days. That rain brings the greased and oil in the street up to the surface causing slippery conditions. It is not uncommon for a car to slide past a stop sign or red light into an intersection and causing a broadside T-bone car crash. Drunk or Impaired Drivers – People who drive while intoxicated from alcohol or impaired from drug use place all of us at risk. Those irresponsible individuals are operating vehicle with reduced or impaired thought, sight and reflexive abilities. They fail to see traffic signals or other vehicles. They misjudge other car’s location and speed. They often take risks that they would not otherwise take in other circumstances. When these DUI drivers enter an intersection, T-bone or broadside car accidents become more likely and often with tragic results. The Miami wrongful death lawyers and Miami injury attorneys at the Wolfson Law Firm stand ready to help you and your loved ones after a drunk or impaired driver T-bone car crash. Road Rage – Too many drivers exhibit reckless and aggressive behavior in Miami. Road rage can result in collisions in intersections. If an aggressive or reckless driver T-bones or broadsides your car then you should be clear about the facts when you speak with the police officer. Understand what you need to do after a car accident and protect yourself and your rights. Get medical care and then contact a Miami car accident lawyer and personal injury lawyer to assist you in your claim. Distracted Driving – This is becoming an epidemic in Miami and all over Florida. Drivers distracted by cell phones and texting are not paying attention to the road. We have all seen the commercials of people texting who get T-boned as they enter an intersection after ignoring a stop sign or red light. The results can be horrific and tragic. Intersection accidents can result from all forms of distracted driving. Miami distracted driving accident lawyers can help you if you are injured in one of these car accidents. Failure to Yield Right of Way – One of the more common car accidents Miami injury lawyer see is the left-turn crash. One car thinks they can make the turn safely. They misjudge the speed of the oncoming car. They think the other driver will stop in time. Sometimes they just don’t see the other car. No matter what, the police officer will give the ticket to the turning vehicle because the oncoming car had the right-of-way. The left-turning car had a duty to yield and because they didn’t a T-bone broadside car crash occurred. Running Red Lights – All too often in Miami, drivers act like the yellow light will stay yellow forever. In driving schools, we are all taught that yellow means yield. But in Miami too many drivers see yellow and hit the gas pedal. Time after time, Miami car accident lawyers and Miami wrongful death attorneys see the results of these poor decisions. Not only do these choices result in T-bone crashes, the impact is enhanced because of the increased speed the driver used to try to beat the yellow light. At the Wolfson Law Firm in Miami, our car accident lawyers and attorneys help good folks who were injured in T-bone or broadside car accidents. Our Miami wrongful death lawyers also represent the family and loved ones of those who tragically lost their lives in an intersection car crash. Our personal injury and wrongful death legal team in Miami is ready to help you and your loved ones. Just call us at (305) 285-1115 for a free and confidential consultation. You can come to our office or we can come to you. We invite you to review our qualifications and orresults. Our Managing Attorney Jonah Wolfson is a bilingual wrongful death lawyer and personal injury attorney in Miami. We at the Wolfson Law Firm stand ready to aggressively represent you and your family. The Miami personal injury lawyers at the Wolfson Law Firm serve the good people of Florida including the neighborhoods of Homestead, Florida City, Naranja, Princeton, South Miami, Coral Gables, Coconut Grove, Key Biscayne, South Beach, Edgewater, Surfside, Miami Shores, Aventura, Ives Dairy, Ojus, Hialeah, Miami Lakes and all the neighborhoods of Miami-Dade County.